Short on space and don’t have room for a stand? Or simply prefer your television to be in a raised position rather than at eye level? Either way, if you’re going to attach your television to a wall, you'll need one of the best TV wall mounts. Now, to be truthful with you, wall mounting your gogglebox feels a bit uncool at this point in time, unless it's a Samsung Frame. 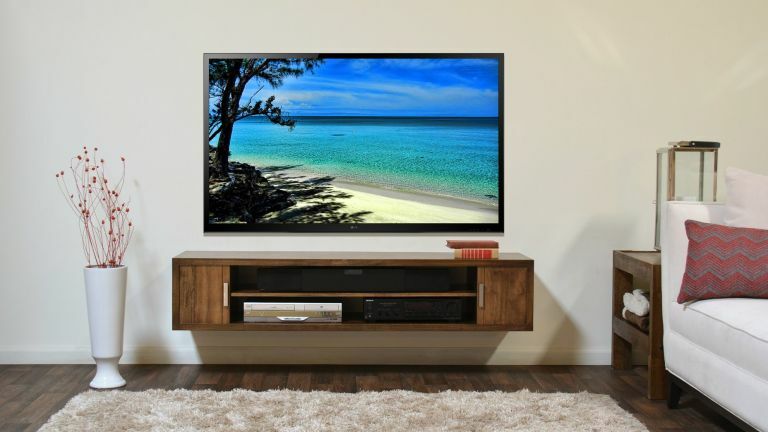 However, there is still plenty of demand for nailing tellies to walls, especially for business and hospitality purposes, and as a bedroom space-saver. So, just for you, here are the best TV wall mounts available. We advise getting professional help for this task. Do not attempt to mount one yourself until you've checked your walls and are feeling very confident. Otherwise, if your entire plasterboard wall immediately falls down and your TV explodes, don't come crying to us. You've got the mount, but wait, is something missing? Before you head on through to Amazon or PC World to find the best wall mount for you, there are a number things that you’ll need to consider so you can work out whether you require a fixed, tilting or articulating wall mount. To explain: a fixed wall mount is exactly that – you can’t move it – so you need to be sure that the place and the height that you position it is the best it can possibly be. A tilting wall mount will enable you to angle the TV up or down to optimise the viewing experience, whether it’s angling it so you can view it from the sofa, or positioning it so you can watch TV while you’re doing the ironing. Then there’s articulating TV mounts; these can tilt, swivel and pull out from the wall, giving you more freedom in how you position them. Secondly, you’ll need to consider the size and weight of your television. For example, PC World are selling this Sanus LT25-B1 Tilt TV Bracket, which has the capacity to support televisions as large as 90 inches, while others may not be able as compatible with a television so large. Generally, wall mounts use the VESA screw system, so make sure your television is compatible with that before you go ahead and buy one. It very probably will be. Our list features a range of wall mounts from recognised retailers, including Amazon and PC World. Whether you’re looking for functionality at a minimum cost or a singing and dancing one which may cost that bit more, we’ll help you to find the best wall mount for your television so viewing your favourite show, or football team, is the best it can possibly be. With its virtual tilting axis and post-installation height adjustment capabilities, this Sanus wall mount has earnt itself first place in our list. It has the capability to support televisions between 37” and 90”, making it a pretty fail-safe unit, whether you require it for your home cinema room or for standard lounge viewing. Those who don’t have the patience with cabling will love the fact that it features a handy ClickStand so you can connect and alter cables without dismounting your entire TV unit, and those concerned about where they’re going to place their soundbar may be interested to learn that the stand is fully compatible with the VMA201 soundbar speaker mount. This wall mount from Invision has a lot of features to be thankful for, including swivel, tilt and pull out capabilities to ensure you benefit from the best positioning, no matter where you are in the room. Thanks to its stress tested load-bearing compression hinges and and cold-rolled carbon steel composition, it is commended for its strength, even when protruding your television from the wall by 500mm. Invision has given it an ultra slim design, which means you can position your television flush against the wall if desired, and thanks to its integrated cable concealment panels, you can keep wiring organised and hidden, ensuring your lounge remains neat and tidy. Providing your television is no bigger than 70”, this television stand is a great alternative to our number one product. While it isn’t compatible with a soundbar speaker mount, it still features the same tilting function and Echogear say is features wall plate openings for in-wall cable management. With its 15 degree tilt action, you have the freedom to angle the television precisely to avoid glare. The consensus seems to be that the mounted TV doesn’t sit flush against the wall, however that means that adjusting cables behind the unit is easier. A bonus is that it comes with a HDMI cable, which means you’ll always have one spare. A TV mount doesn’t have to cost the earth, especially if you’re looking to buy several to kit out various rooms. You can fully adjust this mount to fit VESA standard layouts on TVs as small as 23” and as large as 55”, perfect if you’re looking for a bedroom and lounge units. With the capacity to support televisions with a weight up to 95kg and with a lifetime manufacturer’s guarantee, we’re pretty certain this wall mount will serve you well, despite being so much cheaper. The consensus among purchasers seems to be that it’s fiddly to put together, but once complete, they’re happy with the quality. It’s probably fair to say that not many homes now have a 32” television as their main screen, however smaller televisions are often the perfect size for bedrooms and even businesses. Whether it’s watching your favourite film from the comfort of your own bed or entertaining the customers with the music channel while they wait to have their haircut, the fuss-free design of this TV stand has an awesome amount of manoeuvrability, so it’s sure to be handy if wall space is on the small side. With a 70 degree vertical tilt, it’s the perfect choice for the waiting room- just bear in mind that there’s a low weight limit to this stand too.